Belize enjoys a subtropical climate and it is characterized by four seasons, two rainy and two dry, not all equal in length. Average yearly temperatures range from 50-95°F, with a mean annual temperature of 79°F. February through to May is one of the dry seasons with April and May being the hotter months. 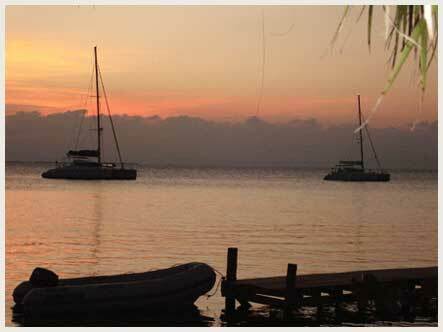 The Cayes in the dry season enjoy warm tropical breezes with temperatures reaching into the 90s. The sailing conditions are excellent; with the trade winds blowing 12 – 15 knots and the inner waters being relatively calm as they are protected by the barrier reef, this truly is a magnificent sailing ground. The second dry season is during hurricane season and is around August, usually lasting between 2-6 weeks, this is called the Mauger Season. June to August is a rainy season, the weather is hot and humid and rainfall can become very heavy. The average yearly rainfall is 50 inches in the North and 170 inches in the extreme south. The second rainy season is September through to January, with the rains coming from tropical depressions and cold fronts. However, between these fronts the weather can be beautiful with hot, glorious sunshine. Belize lies in the hurricane belt and these have often come later in the season. The hurricane season lasts form the beginning of July to the end of October.